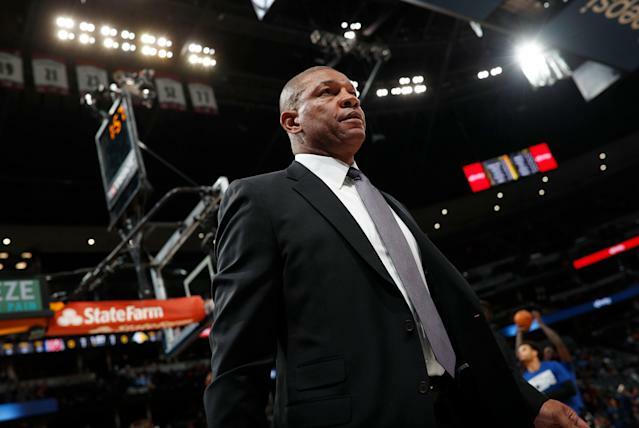 Doc Rivers said Tuesday that he plans to remain in Los Angeles for the long-term. And that means with the Clippers. The Clippers coach since 2013, Rivers told reporters that he has no intention of pursuing a potential Lakers opening in the offseason and has worked out a long-term deal with owner Steve Ballmer. Lakers head coach Luke Walton is widely expected to be fired in the offseason, leading to speculation that Lakers president of basketball operations Magic Johnson would pursue his friend Rivers as his replacement. Rivers has compiled an 887-654 record over a 20-season coaching career with the Orlando Magic, Boston Celtics and Clippers. He won an NBA championship with the Celtics in 2008. Rivers told reporters that he and Ballmer agreed to remove an opt-out clause from his contract early in the season. Tuesday’s announcement appeared to be an effort to fend off speculation about jumping to the Lakers. "Just so we won't talk about this for a while, let me end this right now — Magic Johnson and I are very close friends, as you know, and that's what we are," Rivers said. "Early in this year, we (Ballmer and I) both decided let's end this thing. Take this out and extend and make it a longer deal. Rivers didn’t completely shut the door on speculation, noting that the paperwork on the agreement has not been done. "We've done that a while ago, we just haven't, all the paperwork and that stuff is still being done,"Rivers said. In his sixth season with the Clippers, Rivers has coached the team to a 41-30 start that has them in the Western Conference playoff race despite the breakup of the core of Chris Paul, DeAndre Jordan and Blake Griffin the last two seasons. The Clippers also traded the best player on their roster this season when they dealt Tobias Harris to the Philadelphia 76ers before the trade deadline.